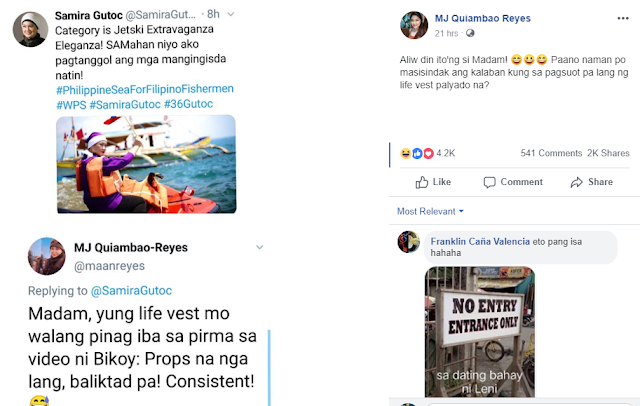 Veteran blogger and prominent social media personality, MJ Quiambao Reyes burned down senatorial bet Samira for her failure to wear the lifevest property during a protest rally against the Philippine government for the alleged incursions of Chinese in the West Philippine Sea. Otso Diretso senatorial bet Samira Gutoc made headlines on social media after her controversial photo showing how she failed on wearing the lifevest whileiring a jetski as part of their protest against the government. Samira Gutoc was quoted as saying "Category is Jetsky Extavaganza Eleganza! SAMahan niyo ako pagtanggol ang mga mangingisda natin!" Due to the statement of Samira Gutoc, MJ Reyes burned down the senatorial bet as he stated "Madam, yung lie vest mo walang pinag iba sa pirma sa video ni Biko: Props na nga lang, baliktad pa! Consistent!" Reyes stated. "Aliw din ito'ng si Madam! ?????? Paano naman po masisindak ang kalaban kung sa pagsuot pa lang ng life vest palyado na?"